Sherman Fairchild Distinguished Professor in Digital Humanities, Dartmouth College professor, Director of the Tiltfactor Lab, CEO and lead designer at Resonym. Flanagan graduated with a BA from the University of Wisconsin–Milwaukee, earned MFA and MA degrees from the University of Iowa, and achieved her doctorate from Central Saint Martins College of Art and Design, UK. She studied film for her undergraduate and masters work while her PhD was in Computational Media focusing on game design. She is the inaugural chair holder of the Sherman Fairchild Distinguished Professorship in Digital Humanities at Dartmouth College, where she has served since 2008. Flanagan has given keynotes to groups ranging from the Association of Professional Futurists  to Computer Supported Cooperative Work, from Philosophy of Computer Games to Games Learning and Society,  and from the experimental STRP Festival to Women in Games. Flanagan was also a 2018 Cultural leader at the World Economic Forum  and an Invited Participant at the World Government Summit. Tiltfactor makes games for social change and research. When Flanagan founded Tiltfactor at Hunter College in 2003, it was the only game research lab in New York City. Focusing on socially conscious and innovative game design, Tiltfactor develops games for social issues such as changing biases and stereotypes, addressing public health, and using the power of games to transform institutions. Through Tiltfactor, Flanagan developed the idea of evidence-based design and values-centered design.Today the research lab is based at Dartmouth College and continues its mission to design, understand, and promote transformative games in all of their myriad forms: sports, card/board games, apps, locative media, and more. Her art has been exhibited around the world and she was featured in the video game art documentary 8 BIT. Within the field of culture and technology, she is known for her theory of playculture. Flanagan's artwork deals primarily with how the design and use of technology can reveal insights into society. Other work is concerned with the representation of women in cyberculture. 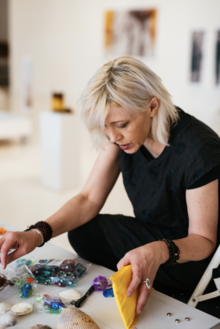 Her artwork has exhibited internationally at venues including The Whitney Museum of American Art, SIGGRAPH, Ars Electronica, The Guggenheim, and others. [help me know the truth] (2016) is an interactive exhibit based on the idea that everyone is constantly judging others at the same time that they are aware others are judging them. Participants would take their own pictures that would then be used in the exhibit. They would be given two slightly altered images to choose from in order to match a given word. The work used computational neuroscience to show how beliefs people have about facial features can be related to culture and identity. The work received the Award of Distinction at the 2018 Prix Ars Electronica. [borders] is a 2009 video series documenting psychogeographic walks in virtual spaces around “virtual” historical sites. They are shown on monitors and projected in gallery space. The work explores borders geographically, politically, and conceptually. The walks in [borders] are beautiful, and, as though we were transported directly into Thoreau's walking shoes, one can "glimpse Elysium,” but only as Thoreau might have: Whilst walking along, surveying the boundaries and divisions. In following virtual property lines, the walker becomes stuck in stones, sent underwater, and literally teeters at the edge of the world, thus exposing the algorithmic nature of the rendering of landscape and the invisible disruptions in a seamless world. [borders] has since been exhibited in several locations including the Museum of Art, Architecture and Technology in Lisbon, Portugal in October of 2019, the Museum of Fine Arts in Cologne from 2017 to 2018, and the Electronic Language International Festival in 2014. [xyz] (2009) combined Flanagan's interests in virtual environments and interactive writing, allows participants to build poetry in 2 dimensional game worlds. Player-writers navigate three different worlds, each representing one axis and containing 1/3 of a larger text. As the players construct stanzas they are projected onto a central screen combining the three disparate texts into one new work. [collection] uses downloadable software to scan users' hard drives, glean random files, and store the collected information on a shared server. The combined data is then displayed, creating what has been described as a virtual networked collective unconscious. It has been featured in Sydney, Barcelona, and in the 2002 Whitney Biennial. [domestic] (2003) is a modification of the first person shooter game Unreal Tournament 2003. Combining elements of digital narrative and video game play, Flanagan uses the games engine to create a home-like environment that conveys images relating to a significant childhood memory of hers. On her way home from church in her hometown in rural Wisconsin, she noticed smoke coming from her family's house. She frantically raced toward it, knowing her father was inside. The work suggest internal turmoil rather than outward aggression by replacing physical battles with psychological ones. The work is featured in the book New Media Art. In 2018, Flanagan exhibited what she refers to as a "computational collaboration," which was an installation piece done with computer software and a projector. The software, developed by Flanagan herself, was able to combine the poems of French surrealist artist Dora Maar with her own. Maar's poems would start on the left and Flanagan's on the right, then the software would merge the poems together to create new ones with different meanings than they had originally. Flanagan describes this process as a way to collaborate with the late Dora Maar. Flanagan has also contributed to a number of academic journals, anthologies, and conference proceedings. Values at Play in Digital Games (MIT Press, 2014) with Helen Nissenbaum features a collection of guest writers including Frank Lantz, Celia Pearce, Tracy Fullerton, and more. Recent research explores the psychology of change in games. Flanagan is also a poet, with poems published in journals such as The Pinch, Barrow Street, The Iowa Review. In 2017, Flanagan published her poetry book, Ghost Sentence. ^ "Biography of Mary Flanagan." Cyborg Anthropology. Cyborg Anthropology, 5 Nov. 2011. Web. ^ "Mary Flanagan." Board Game Geek. BoardGameGeek, LLC, n.d. Web. 02 Apr. 2015. ^ "The Winners of the 2018 Prix Ars Electronica". Ars Electronica Press. Retrieved 2019-03-27. ^ "Honorary Degree Recipients | Illinois Institute of Technology". web.archive.org. 2016-08-07. Retrieved 2019-03-27. ^ "Announcing the 2018 Arts Writing Award Recipients". Carl & Marilynn Thoma Art Foundation. 2018-06-14. Retrieved 2019-03-27. ^ "Games for Change Festival Recap". Games For Change. 2016-07-05. Retrieved 2019-03-27. ^ "Getty Research Institute Announces 2016/2017 Scholars In Residence and Artist In Residence Fiona Tan | News from the Getty". news.getty.edu. Retrieved 2019-03-27. ^ University, Office of Web Communications, Cornell. ""Skin Practice": Society for the Humanities Annual Fellows' Workshop". Cornell. Retrieved 2019-03-27. ^ "Mary Flanagan will be Distinguished Visiting Fellow in 2014-15". web.archive.org. 2017-09-07. Retrieved 2019-03-27. ^ "People- Salzburg Global Seminar". www.salzburgglobal.org. Retrieved 2019-03-27. ^ "Professor Mary Flanagan Participates in White House Consortium | Dartmouth News". news.dartmouth.edu. Retrieved 2019-03-27. ^ "APF Orlando Gathering: Mindfulness in a Future of Simulations and Games". Association of Professional Futurists. 2013-06-10. Retrieved 2019-03-27. ^ "CSCW 2014 - Program | Keynote". cscw.acm.org. Retrieved 2019-03-27. ^ "Arts and Culture at Davos 2018". widgets.weforum.org. Retrieved 2019-03-27. ^ "Values At Play". Retrieved 2019-03-29. ^ "Resonym | About". Retrieved 2019-03-15. ^ Wilson, Mark (2015-10-28). "A Simple Card Game Designed To Rewrite Gender And Racial Stereotypes". Fast Company. Retrieved 2019-03-29. ^ "Mechanica". Kickstarter. Retrieved 2019-03-15. ^ "Mary Flanagan and Her Thesis, 'Play Culture.'" DocSMARTs: PhD in the SMARTlab Digital Media Institute. University of East London, n.d. Web. 31 Mar. 2015. ^ "Mary Flanagan & Andrew Gerngross". FILE. Retrieved 2016-02-27. ^ “[Help Me Know the Truth].” MARY FLANAGAN, maryflanagan.com/work/help-me-know-the-truth/. ^ "[collection] | MARY FLANAGAN". maryflanagan.com. Retrieved 2016-02-26. ^ Tribe, Mark; Jana, Reena. New Media Art. Taschen. ISBN 3822830410. ^ "Mary Flanagan, 'domestic.'" The Brown University Wiki Service. Brown University, n.d. Web. 31 Mar. 2014. ^ "Feedback in Spain." Post.thing.net. The Thing, Inc., n.d. Web. 31 Mar. 2015. ^ "The ZKM | ZKM". zkm.de. Retrieved 2019-03-29. ^ “[The Mirror Book].” MARY FLANAGAN, maryflanagan.com/work/the-mirror-book/. ^ Mosher, Michael R. "Review of 'Critical Play: Radical Game Design.'" Archived 2015-04-19 at the Wayback Machine Leonardo Reviews Online. Leonardo, 4 Jan. 2010. Web. 31 Mar. 2015. ^ Mosher, Michael R. "Review of 'Reload: Rethinking Women + Cyberculture.'" Archived 2016-03-04 at the Wayback Machine Leonardo Reviews Online. Leonardo, 4 Jan. 2010. Web. 31 Mar. 2015. ^ Press, The MIT. "Reload". The MIT Press. Retrieved 2019-03-29.
Review of Digital Media Revisited: Theoretical and Conceptual Innovation in Digital Domains and Flanagan's "analysis of computer gamers' problematic relationships to representations of women." Flanagan's article on gender and cyberspace in Art Journal.